Some common causes of concussions or closed head injuries in the workplace include slip and falls, falling objects, crane operators, construction site conditions, car crashes, or physical assault. Often, the seriousness of these injuries is not immediately obvious because you may not be visibly hurt. However, certain symptoms like headaches, memory loss, or dizziness may persist for months after the closed head injury. The dedicated workers' compensation lawyers at Pulgini & Norton can help employees pursue benefits for their head injuries. You should not hesitate to consult a Boston concussion attorney to assert your rights. The most common form of a closed head injury is a concussion. These are suffered because of a blow to the head. Even if the object or surface that hits the head does not penetrate, the impact can shake the brain and result in a traumatic brain injury or serious concussion that permanently alters normal brain operation. Under Massachusetts law, disabled employees who cannot come back to work, or cannot come back to work in the same capacity, are entitled to compensation regardless of fault. This means, for example, that if you were supposed to wear a helmet at a construction site but forgot to wear it and were hit on the head with a falling hammer, you can potentially recover benefits for the full extent of your harm. This is different from a personal injury claim, in which a defendant can argue that you were partly at fault for the incident and that the damages should be reduced accordingly. Your employer has seven days from the fifth day on which you are unable to earn full wages to report your injury to its workers' compensation insurer, and the insurer in turn has 14 days from receiving notice to send you a check or a denial. You may be asked to attend an independent medical exam (IME) with a doctor chosen by the insurer. “Independent” is usually a misnomer, since the doctors are often biased towards the insurer and a denial of benefits. However, your benefits may be denied if you do not attend the IME. It is important to consult with a workers' compensation attorney before going to the exam. IMEs are often used to show inconsistencies in a claim, or to show that a pre-existing condition is the source of the harm, rather than a job-related event. For example, the doctor may claim that you received the closed head injury by playing sports after work, rather than a fall on site. 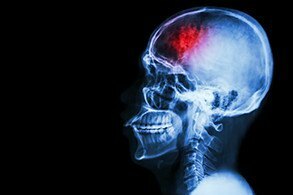 Among the benefits you may be able to recover through the workers' compensation system for a closed head injury are partial disability, temporary or permanent and total disability, medical expenses, a lump sum settlement, sensory impairment, vocational rehabilitation, and prescription medication. A number of factors can affect the benefits you receive, including how severe your injuries are and your average weekly wage. Most employers are required to procure workers' compensation insurance for their employees, and benefits are supposed to be dispensed without attention to fault. However, in many cases, insurers resist paying benefits or resist paying the full amount to which an employee is entitled. Since closed head injuries often do not result in immediate visible damage, an insurer may not believe the extent to which you have been harmed. If you suffer a concussion or closed head injury at your workplace, you should enlist a work injury attorney to guide you through the process. At Pulgini & Norton, our workers’ compensation lawyers represent Boston residents as well as injured individuals in Hyde Park, Andover, and New Bedford, among other Massachusetts communities. Call us at 781-843-2200 or contact us via our online form for a consultation.